‘Known by the trees’ – Autumn glories from the behind the demesne wall. The view from the front of Midleton Lodge shows the grove of trees on the north bank of the Dungourney River in mid-October 2016. The grove stands in front of the wall that separates the demesne from the woollen factory built by Marcus Lynch in 1794. This is factory is now part of the Jameson Experience, while Midleton Lodge is now the local council office and Lynch’s demesne is a public park. Lynch planted the trees in 1806-09. Autumn ended in Ireland on Thursday 17th November when a cold Arctic snap plunged the comfortable temperatures into a biting winter mode with a dusting of snow in many parts of the country. Midleton, happily, escaped the snow but not the cold. The long, dry, sunny and pleasantt autumn weather was a most welcome season before the onset of winter. One of the glories of Midleton, and East Cork in general, this autumn been the colour of the leaves as they changed from green to yellow to red and then to brown before falling. This abundance of trees in East Cork is due to an ironic circumstance of history. William J Smyth of UCC referred to this in a lecture he gave to the Royal Dublin Society in 1996. The title of his lecture was ‘The Greening of Ireland – Tenant tree-planting in Ireland in the eighteenth and nineteenth centuries‘; Smyth introduced his lecture with quotations from two Irish poems – one an anonymous but well known seventeenth century Irish (Gaelic) verse that we all learned at school, and the other twentieth century quotation came from a poem by Austin Clarke. Kilcash Castle in County Tipperary is best known through the anonymous seventeenth century poem lamenting the passing of the old order, symbolised by the loss of woodlands. The poem ‘Kilcash‘ refers to the systematic destruction of the ancient Irish woods and forests in the seventeenth century by the new English planters who had been granted estates in Ireland. Part of the reason for the destruction of the woods was to deny any Irish rebels and outlaws a place of refuge. A second reason was to enable the planters to make a quick financial return on their new estates – England was severely short of good timber for building houses and ships and for barrel staves. In addition wood was needed for making charcoal to smelt iron, especially iron for making cannon for the fleet. One of the key culprits in this activity was Richard Boyle, first Earl of Cork. Between 1600 and 1670 most of the remaining Irish woodlands were lost as a result of the various plantations imposed on different parts of the country. Clarke’s poem makes ironic reference to the fact that those planter families were later instrumental in planting new trees to take the denuded look off their surrounds – mind you, this was done mostly inside the high walls surrounding the demesnes of the ‘Big House’.Those walls screened the bare countryside from easily offended eyes, and protected both the inhabitants and their trees from the peasantry. Thus the descendants of the people who originally cut down the forests and woods were also the first to begin replanting, often with foreign species! Even today, a plantation of deciduous trees indicates the site of a ‘big house’, whether intact or in ruins. Despite all this planting, British visitors to Ireland in the nineteenth century frequently noted the bare appearance of the Irish countryside, noting that the few trees were to be found within the walls of demesnes. Even now, with all the State forestry planting programmes, Ireland has only 8% of its land under forest or woodland, the lowest percentage of tree cover in the EU. Donal P. and Eileen McCracken published a paper with the title ‘A Register of Trees, Co Cork, 1790-1860‘ in the Journal of the Cork Historical and Archaeological Society in 1976 giving the register of tree-planting in County Cork. By the mid-1800s County Cork possessed nearly 52,000 acres of trees in plantations, nearly 15% of the Irish total.The register gives the numbers of trees planted by civil parish, with the townlands where the trees were planted being named. There are problems with the list – some townlands are clearly placed in the incorrect parish, so caution is advised when using this source. A path in Marcus Lynch’s grove of trees between the Dungourney River and the wall of the old distillery in Midleton in October 2016. 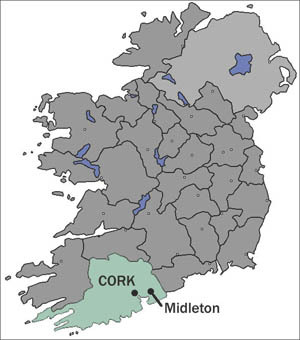 The figures for Midleton Parish (called Middletown in the text) are as follows: Marcus Lynch planted 2010 in the grounds of Midleton Lodge between 1806-09; Samuel McCall planted 5,590 trees at Charleston in Castleredmond in 1809-12, and Swithin Fleming (incorrectly named Southeen in the text) planted 1,770 trees at Lakeview in Castlererdmond in 1831 (which indicates that his house was built by then); William Mc O’Boy (McEvoy?) planted 2,830 trees in Gearagh in 1815; in Bawnard, John Lander planted 5,100 trees in 1824 and Daniel Humphries planted 26,000 trees in 1827; in Ballyedkin, John Leech planted 61,300 trees in 1827-32, while Thomas Wigmore planted 144,870 trees in 1828-33; in Deer Park South, George Turkey (Tuckey?) planted 3,240 trees in 1832; in Broomfield, Benjamin James Hackett (the distiller) planted 1,480 trees in his grounds in 1834. This list gives a total of 254,190 trees planted in the area in and immediately around Midleton between 1806 and 1834. Sadly many of these trees have been lost, but a lot survives – Marcus Lynch’s plantings are still a joy to behold just off Main Steet, and on the Youghal Road, in Midleton. But further afield we can see that planting was just as intense. The woods at Rostellan were part of the demesne of the Marquis of Thomond’s East Cork estate. They are now run by the state forestry company. On the wall of the barrage in the foreground is one of three milestones installed there in 1734. In the townland (and parish) of Aghada, Robert Austen planted 28,470 trees in 1814; Michael Goold planted 27,620 trees in Jamesbrook (Garranekinnefeake parish) in 1807-11; in the parish and townland of Rostellan the Marquis of Thomond planted 55,140 trees in 1827, in Rossmore (Mogeesha parish), Edmund Coppinger planted 21,340 trees in 1824; in Barnabrow (Cloyne parish) in 1809-12 Timothy Lane planted 27,940 trees, while John Royal Wilkinson planted 20,100 trees there in 1831. Planted in the 1980s to mark the entrance to the newly built St Colman’s Community College, on Youghal Road in Midleton, this avenue looks very well established today. It emulates the type of planting established around the town in the years around 1800. This is not a complete list (it leaves out places like Fota and Ballyedmund) but it shows that many landowners in East Cork felt it necessary to plant trees to improve their estates in the early nineteenth century. Despite losses in the 1940s, the legacy of this planting is the rich tapestry of trees that enrich the local landscape especially in summer and autumn. The good news is that such planting continues – directly opposite Marcus Lynch’s old house stands St Colman’s Community College which was built in the early 1980s. One farsighted decision made by the school was to plant an avenue of trees leading from the gate to the main entrance – just a few decades later it looks splendid.